Origin and Habitat: Sonora, Mexico. Habitat: Fouquieria macdougalii (Tree ocotillo) is locally common in open exposures on a wide range of soil types on rocky flats and south-facing slopes, hillsides, lava beds, mesas, and sandy playas. The abrupt western limit is probably determined by decreasing summer rainfall, the northern limit by low temperatures. 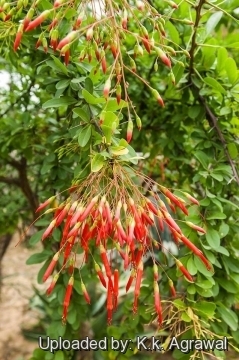 Tree ocotillos are an important food resource for northward-migrating humming birds in late February and March. 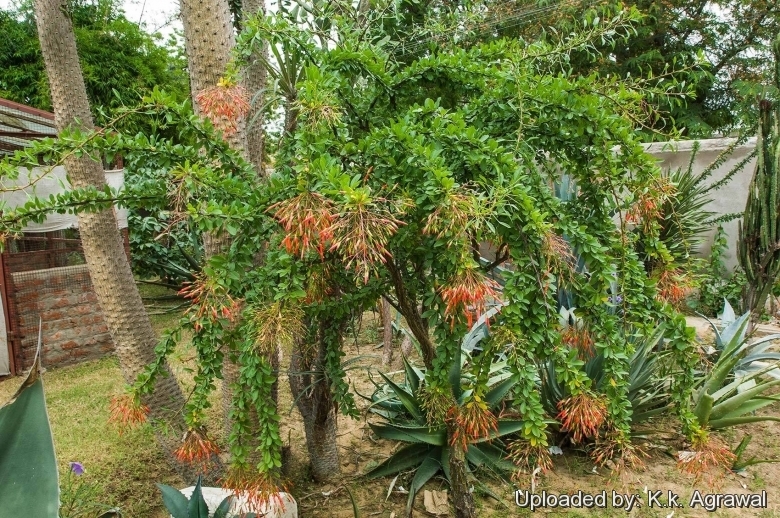 It is one of the major components of the he higher canopy of the vegetation along with Olneya tesota, Bursera confusa, Cercidium praecox, Cercidium microphyllum and Prosopis velutina; the most common cactus species are Lophocereus schottii, Stenocereus thurberi and Stenocereus alamosensis. Echeveria paniculata Sessé & Moc. ex Bonpl. 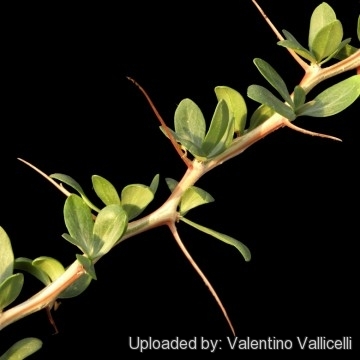 Description: Shrubby in the desert, Fouquieria macdougalii becomes a small tree up to 6 (occasionally 11) metres high with divergent, much-branched, loose, open, spiny stems from one or several straight basal trunks. 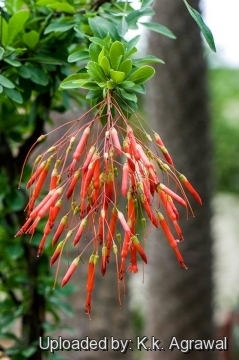 Deep scarlet flowers are held at the tip of the branches in clusters, giving the effect of a red sparkler. It is closely related with Fouquieria diguetii which distinguishes for its more erect conical panicles and (on larger plants) diagonally striped bark. Trunk: 1-2 m high and 15-40 cm in diameter, luminescent light green, smooth and with thin bark peeling into paperlike bronze sheets, the bark and former attachment points of branches forming a dark mosaic. The wood contains 60-70% water, a rather high value for a shrub. 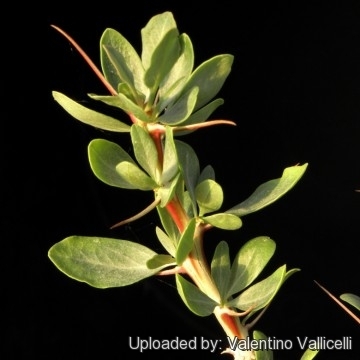 Leaves: Dimorphic, long-shoot leaves are 30-55 mm long and 5-11 mm wide, short-shoot leaves 12-30 tun) long and 7-14 nun wide. Elongating stems produce long-shoot leaves in the summer rainy season. Short' shoot leaves appear after heavy rains at any time of year. Leaves are drought deciduous, and plants are leafless much of the year. Inflorescence: Indeterminate laxly corymbose panicles arising from a terminal stem, about as broad as long, but variable depending on water availability, with heavy rain, the plant produces large, much-branched paniculate inflorescences. In dry seasons, the inflorescence may be reduced to a raceme. 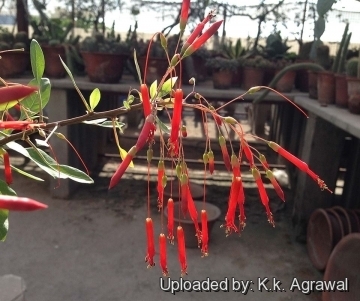 Flowers: Bright red to scarlet , 18-26 mm long and about 4 mm wide at the throat. Pedicel (3-)5-30 mm long, 0,2-0,6 mm in diameter. The position of the stigmas above the anthers probably favours outbreeding, but the flowers are self-compatible to some extent. Blooming season: blooms after rains, usually between July and October, occasionally in other months. Notes: Fouquieria macdougalii differs from Fouquieria splendens in its treelike habit, pendulous terminal branches, and lax corymbose panicles. Large specimens in thick forest may be confused with Bursera fagaroides or Jatropha cordata, but the spine-covered, greenish, exfoliating bark, the curving branches, and the bright red flowers are identifying characteristics. 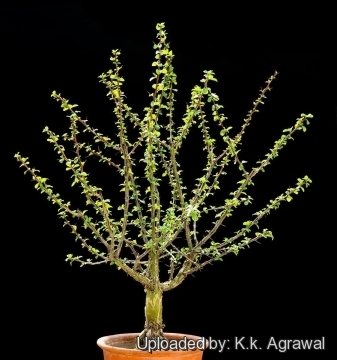 Cultivation and Propagation: Fouquieria macdougalii is a fast-growing tree, but usually relatively short lived (only few decades). Soil: Needs a very well drained soil mix. Exposure: It grows best in full sun to part shade. It needs freely circulating air. Watering: Water regularly in summer keep almost dry in winter. Plants are watered and allowed to dry thoroughly before watering again. If planted in the landscape however, it will often drop all its leaves when it decides to take a rest. When this happens, cut down on the watering until the leaves start to appear again. Hardiness: Hardy to -4°C they prefer a dormant, winter rest period. Fertilization: If fertilizer is used, it should be diluted to ¼ (one-quarter) the recommended rate on the label. Use: In Mexico it is sometime used as an hedge plant. Although they are not a strong tree, planted thus they give off numerous well-armed, inter-twined branches, an effective deterrent to larger animals. The bark is used as a substitute for soap, especially in washing woolens. The bark is also widely used as a source of soap and shampoo. 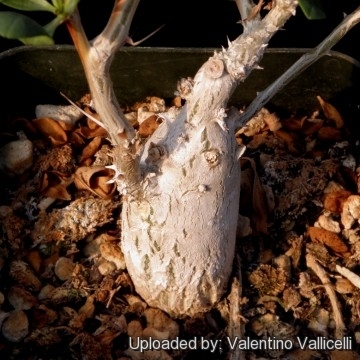 Manteinance: Once this plant is established in its new pot, it should be cut back in height to encourage branching, to maintain an attractive shape and to ensure pachycaul habit. If pruned and kept somewhat pot bound, it can be maintained at a manageable size, depending on what ''manageable size'' means to you. Propagation: It is propagated from cuttings taken in the spring or from seed when available. Warning: The thorns can be hazardous.